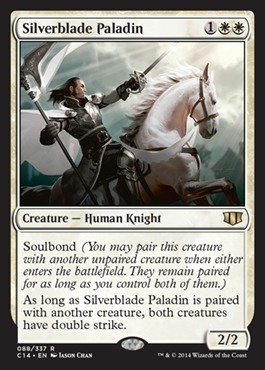 As long as Silverblade Paladin is paired with another creature, both creatures have double strike. ZendikariWol on Swords to the sky! Cats > Knights in terms of voltron tribes. Nazahn, Revered Bladesmith > the Bright Twins in terms of voltron commanders. But still, I can suggest. 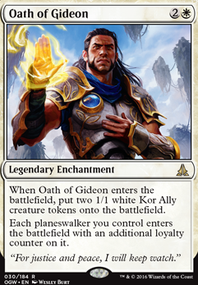 Jor Kadeen, the Prevailer is pretty nice, though not on-tribe. Adriana, Captain of the Guard is pretty sweet. Bloodsworn Steward is also that, and along the same vein is Crimson Honor Guard . Hero of Bladehold is a sweet token generator, and battle cry is relevant. Relief Captain is a highly underrated card imo. 6 power for four mana, across four bodies? Yes please. Silverblade Paladin is a lot of value. Skyhunter Skirmisher and Skyknight Legionnaire are some spicy air bodies. Varchild, Betrayer of Kjeldor is among my favorite cards. Hey Catpocolypse, thanks for the comment. You're correct in saying that there's no real wincon. Usually I try to stall the game out long enough to let some combination of Silverblade Paladin , Rancor , and powered up Fleecemane Lion s and Warden of the First Tree s get winning damage through. 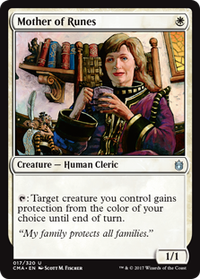 Collected Company would definitely be good card advantage at instant speed, especially if that lets me take out a planeswalker or some attackers. However, there are still some matchups where 2 instant speed creatures aren't enough to oppose explosive plays. 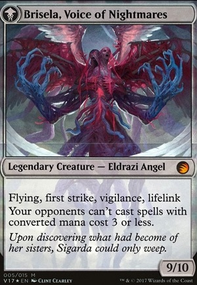 My issue with replacing Mana Tithe is that I need low-CMC answers to early threats or later things that opponents tap out for, to slow down affinity or elves, or stop a t3 Blood Moon and such. Thanks again for the input, I'll definitely include a copy or two, just need to keep playtesting for a 3rd or 4th copy. So as I mentioned on twitter. We definitely need more ramp in this deck. My equipment deck ways in somewhere around like 20 or 25 total artifacts, id expect that you end up in similar territory after adding some mana rocks. Worn Powerstone is an absolute staple for me, Smothering Tithe is amazing, and then a handful of the CMC mana rocks are good. Gilded Lotus although slow, I have found helpful for that extra needed mana that you need to move around equipments late in the game. So get your mana ramp count to at least 10, I'm counting 5 right now, but a lot of it is conditional or slow. In limited testing I haven't had great results with Boreas Charger, so I may cut that one, but more testing is needed. Also just noticed sol ring is missing from the list. Highly recommend, its OP. I think your creature package looks great. Only 2 small changes. Ive never had good success with Hellkite Charger so i would cut that one. It takes 13 mana to cast it, and use the untap combat ability, and doesn't pair well with feast and famine because of the timing of the triggers. So Id cut that one. And I've had mixed results with molten primordial. If there aren't tokens running around everywhere it can be really good, but the second there is chump blockers it loses a lot of value. For 1 extra mana you can play insurrection, which easily kills 1 or more players when Aurelia is play. So if you need that effect I would look toward Insurrection . 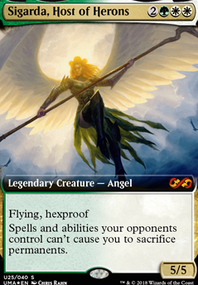 It can be nice to have an Leonin Abunas or Indomitable Archangel especially if theres a lot of removal in your meta, but its not entirely necessary...just something to think about. Also its not really on theme, but I just really like Iroas with Aurelia. Together they have 6 devotion, so very easy to get into creature form, and attacking with it twice just puts a hurting on opponents. Again not necessary, but i just like it as sort of a separate avenue of attack. Oh and I would add in a Kazuul's Toll Collector the free equip is really nice. I think you want to cut just a few spells from the deck as well. My votes would be Dawn Charm and Wild Ricochet . Ive never been able to live the dream on wild ricochet and if its in your hand, 4 tends to be a lot to hold up. Dawn charm is just a bit redundant with comeuppance and teferis, and i don't know that you need all 3. Now with all of this stuff, if there are things specific to your meta it may makes sense to keep some of them. A large portion of my testing was in the MTGO meta which has its quirks. A few other interesting cards to think about. Ive seen people run Nahiri, the Lithomancer , Daretti, Scrap Savant , and Goblin Welder as other ways to get artifacts back. There also the crazy expensive one from antiquities, agrivian something or other. Any of these could potentially be better in the Daring Archeologist spot just something to think about. If you are needing additional card draw. Stolen Strategy is a reasonable place to start, and Memory Jar actually works really well with the recursion you have going already. Land base, things are in good shape. Although I would cut, temple of the false god for a basic plains. I have run out of plains with sword of the animist and emeria shepherd and that makes me very sad. Or you could replace it with a spinerock knoll, a card I've come to like a lot recently. A few other things to think about. I didn't see a lot of double strike. I really like Silverblade Paladin and Duelist's Heritage , makes it really easy to be lethal or generate tons of value with equipment triggers. But otherwise I really like everything. The mana ramp is the big change, and everything else is just some small tweaks. THE most important card in Olric is Concerted Effort . Gotta have that redundancy for a commander-theme heavy deck. In terms of "eating your vegetables," this deck really needs ramp and card draw. Marble Diamond , Knight of the White Orchid (goes well with the knight stuff I mention below, Mentor of the Meek , Mind Stone , Endless Atlas , Alms Collector , Sword of the Animist , Emeria, The Sky Ruin , Solemn Simulacrum , Boreas Charger , and Isolated Watchtower would all be good, here. I would cut a lot of the first strike and add in more double-strikers. If you have both, first strike is useless to share. Arashin Foremost is cheap, and it's serviceable, even without the tribal synergy. Aven Sunstriker , Sylvia Brightspear , and Skyhunter Skirmisher come with flying. Silverblade Paladin can get you attacking the turn before Odric comes out. Solemn Recruit is nothing special, but it beats Master at Arms, at least. Mirran Crusader would be one of the more expensive cards in your deck, but it's very good, and it's a knight, in case you want to add in some knight synergies, since you're heavy on the tribe. Kinsbaile Cavalier would be the best choice to support that, kind of as a backup Odric, although Valiant Knight is also pretty okay. In fact, I really like Heavenly Blademaster with Odric, too, so I wouldn't hesitate to go all in. Also, Gallant Cavalry , Call the Cavalry , and Righteous Confluence all start doing some major work by adding vigilance and making 4/2's once you account for double strike. In terms of keyword soup, Zetalpa, Primal Dawn is good. Same for Akroma, Angel of Wrath . That one is a bit expensive, but haste is hard to come by in mono-white. I could say the same for Lightning Greaves , or at least Swiftfoot Boots . Riftmarked Knight could also have a place if you go knight tribal. I suppose Sword of Vengeance could also be okay? Deathtouch is very hard to come by in mono white, although if you've got a little extra in your budget, Basilisk Collar is very good with first/double strike and gives lifelink, to boot.